We are the leading manufacturer and supplier of the Leather Shoulder Bag in Croco Print to our client. We are the leading organization in the industry to provide our clients the best quality array of Crocodile Leather. Being a quality-centric organization of this industry, we are engaged in providing a wide array of Genuine Crocodile Leather. For more information regarding this product, send your inquiry. 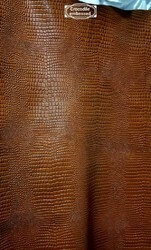 We offer a wide gamut of leather which includes Crocodile Print Leather at economical prices to the clients. These are available in standard & customized shapes and dimensions. The range is designed using high quality raw material and is tested to ensure their flawlessness. Our range is known for its excellent shine, superb polish and perfect finishes. 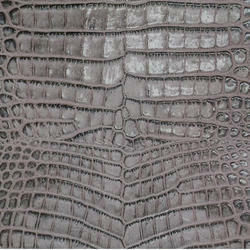 We are offering an extensive series of Croco Leather. These products are extremely employed in the market for diverse purposes. - Thickness : 1.8mm - 2.0mm, 1.6mm-1.8mm, 1.4mm-1.6mm. - Size : 10-18 sq. ft.